Wichita Northwest junior quarterback Austin Anderson (5-11, 170) had an incredible debut in leading the Grizzlies over Class 5A’s top-ranked Bishop Carroll Eagles. Anderson completed 14 of 25 passes for 352 yards and six touchdowns in Northwest’s 61-49 win. Anderson also carried eight times for 111 yards and a score. This week’s challenge comes against a young but talented Wichita Heights team that beat Olathe North 41-21 in Week 1. Olathe North didn’t complete a pass in four attempts against the Falcon defense, but did rush for almost 260 yards. Wichita Heights can score quickly with sophomore quarterback K’Vante Baker’s big-play running ability, so Anderson and the Grizzlies may find themselves in another shootout on Friday night. Senior Matt Dercher debuted as the starting quarterback with a standout performance in the Tigers’ 35-28 win over Bishop Miege. Dercher completed 22 of 37 passes for 339 yards and three touchdowns in the win. All three of Dercher’s touchdown passes went to senior wide receiver Gus Gomez, who caught five balls for 110 yards. He’ll need another solid performance as the Tigers take on Blue Valley West (1-0) on Friday night. The junior quarterback has immediately filled the void left by graduated All-State quarterback Logan Koch. Flaming completed 24 of 36 passes for 311 yards and five touchdowns during a 35-13 win over a highly touted St. James Academy. Expect another strong outing from Flaming when the Jaguars play at Blue Valley Northwest on Thursday night. Conor Craig and Tracy Harris had a big opening night behind the Salthawk offensive line in Hutchinson's week one over Olathe East. It could be more of the same for Hutchinson in their AVCTL season opener against a Newton team still trying to find its footing under first year coach Chris Jaxx. 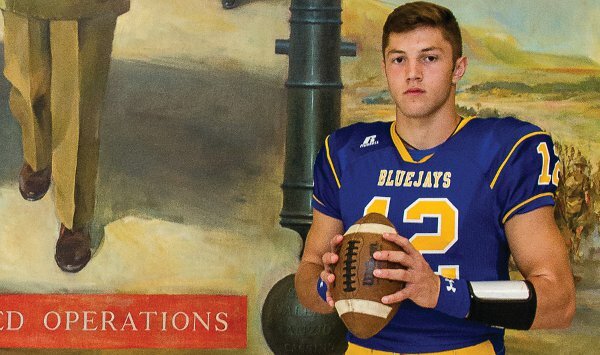 While the Railer squad includes Division I prospects Kade Remsberg and Aidan Mills (K-State commit), the Salthawk front is led by K-State commit and Kansas Pregame coverboy Josh Rivas, a three-year starter and one of the state's top prospects. Ruder enjoyed one of the finest statistical games in his career with 7 of 18 passing for 182 yards with a touchdown and 12 carries for 113 yards and two scores in Norton's season-opening 42-7 victory versus Goodland. Ruder, a Division I talent who carries multiple offers including Kansas State and Tulsa, set a career high in single game rushing yards and had his third biggest passing total of his career. Norton will travel to surprising Plainville in a key MCL matchup this week. Sporing had a big year in 2015 in leading Burlingame to 8M-I semis, and he started the 2016 season right where he left off. Dalton had five rushes for 111 yards and two touchdowns while completing seven of nine passes for 161 yards and five touchdowns. Expect another video game number performance on Friday night against Hartford.